Our royal blogger can’t wait for the first official photo shoot of Prince George . . . we all know how much a baby’s face can change in two weeks! NOW that little Prince George is just over a week old and conjecture about what he’d be called is over, attention has again switched to his mom and dad, widely recognised for their laid-back, natural performance in front of the media at the Lindo Wing at the St Mary Hospital in London. With a forest of cameras focused on them, they were both cool as cucumber sandwiches, and who couldn’t help go “aaaaah” when the proud dad placed a protective hand on his wife’s back and called her “poppet”? The prince’s expert handing of the baby seat also had many a male journalist expressing his admiration on Twitter. Now everyone’s wondering what William’s next move will be. Will he stay on in Anglesey as a rescue helicopter pilot or will he, as reported exclusively in the Sunday Express last weekend, join the Household Cavalry as an officer and be based in London? His presence in the capital will help a lot if he’s called on to carry out more royal engagements, something that seems increasingly necessary given his grandparents’ advanced age. Prince Philip has remained out of the spotlight following exploratory stomach surgery. In fact, he’s the only senior royal who hasn’t yet met his new great-grandchild. He also didn’t accompany the Queen to Balmoral on Friday but will join her there in a few weeks. There is a possibility he’ll meet up with William, Kate and their new arrival when they move into their second home, Anmer Hall, soon. The house is situated on the Sandringham estate and the current tenant is already vacating it, according to the Daily Mail. Renovations are planned there to make space for bodyguards and to provide more privacy for the young family. William has used up all his annual leave so great-granddad Philip will have to wait for a weekend when his grandson isn’t on duty on Anglesey. William has made it known he doesn’t want “special leave” because of his duties as heir to the British throne. He’s currently on two weeks’ paternal leave, but then it’s back to flying choppers . . . The occasion we’re all looking forward to – Prince George’s first official photo shoot – will take place during Will’s leave period. This will no doubt be the first of many for the youngest royal. Can’t wait to see how that baby face has changed in two weeks, because all I remember from the photo session outside the hospital are the active little hands and screaming mouth as William carried him to the car, the cries of the little prince with the big lungs all but drowned out by the clicking cameras. Although Kate doesn’t want to use a childminder – especially during the first few weeks of motherhood – her and William’s Italian housekeeper/right-hand woman did accompany them to Bucklebury. Antonella Fresolone spent years working in the Queen’s household before accepting the job of housekeeper and cleaner with the Cambridges. Building and restoration work is still the order of the day in Kensington Palace, so I’m sure Kate’s parental home of Bucklebury will provide a safe refuge for the whole family. The property is guarded day and night by the police, but inside there’s no sign of butlers or serving staff. Here it’s just the Middletons and the Cambridges, without the “invisible wall” of servants that characterises life in the palace. Once the Cambridges are settled in 1A in Kensington Palace, even a short walk with George in his pram will have to be scheduled. But Kate and the baby will be walking round the gardens with security guards and Lupo in tow, of course. Can’t wait to see the pictures . . .
Is the royal baby fashionably late? 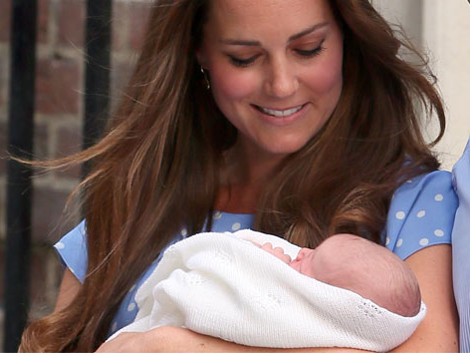 It’s July – the royal baby’s birth month!